No, you can’t rearrange that horrible QWERTY arrangement by pulling the keys off of your Mac, but El Capitan lets you tweak the behavior of your keyboard in several important ways. 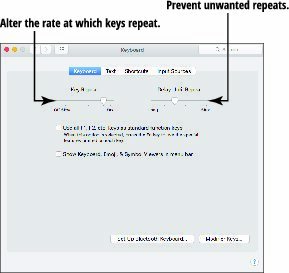 Key Repeat: Move the Key Repeat slider to alter the rate at which a keystroke repeats. Delay Until Repeat: Move this slider to alter how long a key must be held down before it repeats. For those who take a little more time pressing each key, moving this slider to the left helps reduce unwanted repeats. El Capitan also provides the Sticky Keys and Slow Keys features, which can help you if you have trouble pressing keyboard shortcuts or if you often trigger keyboard repeats (repetition of the same character) accidentally. To use these options, display the System Preferences window, click the Accessibility icon, and then click the Keyboard icon in the list on the left. Sticky Keys work by allowing you to press the modifier keys in a key sequence (such as ⌘+A) one after another rather than all at the same time. Slow Keys allows a pause between the moment a key is pressed and the moment that El Capitan acts on the keystroke. To turn on either feature (or both), just select the corresponding Enable check box. Press the Shift Key Five Times: Select this check box and then you can toggle Sticky Keys on and off from the keyboard by pressing the Shift key five times. Beep When a Modifier Key Is Set: Select this check box to play a beep when El Capitan recognizes that you’ve activated a modifier key. Display Pressed Keys on Screen: Select this check box, and El Capitan displays each key you press in a Sticky Keys sequence to help you keep track of the characters you’ve entered. Use Click Key Sounds: Select this check box to add a key-click sound every time you press a key. Acceptance Delay: Drag this slider to specify the length of the delay before the key is accepted. To turn off keyboard repeat — which may be required, depending on the settings you choose for Sticky Keys and Slow Keys — click the Open Keyboard Preferences button, which displays the Keyboard preference settings.